the brass band with the best flow! 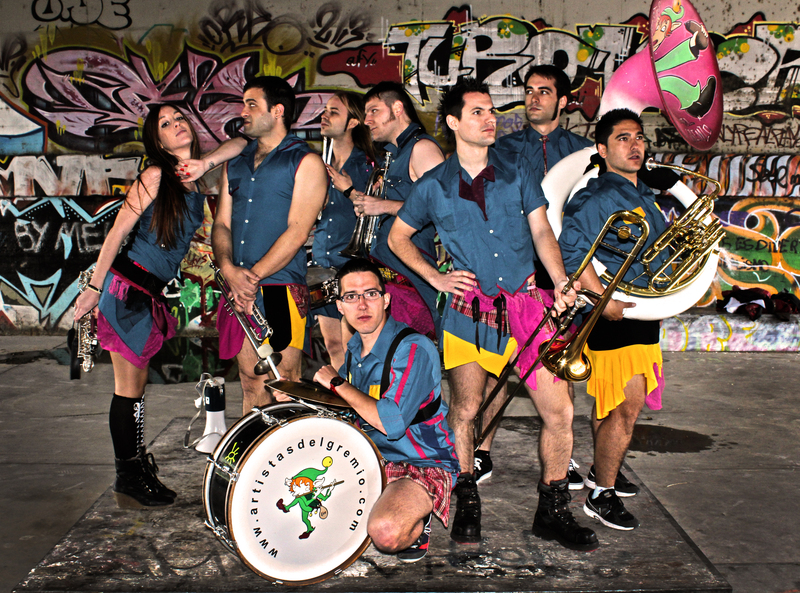 Artistas del Gremio is a charanga, fanfare or brass band characterized by a genuine style based on the interaction with the audience, the energy and next day’s muscle stiffs. In 2005 we started playing popular and traditional song versions around Spain. We soon started having an own identity, composing our own themes, going abroad and showing up as a different band. We have had the good fortune to participate in many festivals at national and international level, such as Durham Brass Internacional Festival (UK), Berlin Brass Festival (2019), Sibiu Internatonal Theatre Festival (Romania), Limoux Brass Festival and Les Moustoussades (France), or Reperkusión, Pirineos Sur, Tamborilé and Holika Festival (Spain). We have also been finalists in the TV show Tú sí que vales (Spanish version of Got Talent) and we have been awarded with prices to the best national brass band at Sabiñanigo’s Brass Band Battle three times in a row, in the I National Contest of Brass Bands in Escucha and the IV Brass Band Contest in San Fermín (Pamplona). We also recorded the soundtrack for the Spanish movie Que se mueran los feos in 2010, we have collaborated with artists at national level and we have recorded three albums: Artistas del Gremio & the musicolocos dream team (2009), Felices agujetas (2013) y Punkis de conservatorio (2018). But… why don’t you know us a bit better?